Welcome back to another installment of Naruto Gaiden Impressions now on it’s new home AniTAY if you’ve missed my last two write ups you can find them here and here. As always before reading this it’s of course best to read the chapter first as we’ll be dealing with spoilers. Anyways enough house cleaning lets move on. This chapter of Naruto Gaiden seemed for the first time like a bit of a slow down for the series especially coming off the jam packed first two chapters. Of course that was to be expected as it would be near impossible for Kishimoto to keep up the pace without exhausting his supply of stories pretty quickly. Regardless this does not mean nothing happens it just felt as if what did happen was less important in a grand scheme of things then we have previously seen from Naruto Gaiden. Anyways the chapter starts up right where the last ended at the gates to the Hidden Leaf Village where Naruto asks rather cryptically to say sorry to Boruto for leaving so suddenly. With Naruto on his way to find Sasuke, Sarada readies to follow him at a distance, however Chōchō doesn’t seem to realize that following the Hokage will actually require movement. Following this Boruto shows up with Naruto’s lunch a home made bento box and is rightly peeved his father left without actually picking it up; I suppose showing a little bit of maturity that Naruto now puts the village before his stomach. It also conveys a bit more familial connection which in my opinion is one of the most interesting parts to the manga. Seeing an opportunity Sarada pops out and inexplicably nobody seems to wonder why she was skulking around the beginning of a mission that directly involves her long abandoned father... seriously Shikamaru I thought you were supposed to have an IQ over 210... anyways Shikimaru now understands Naruto’s “sorry” really just involved his lunch and nothing more then that. 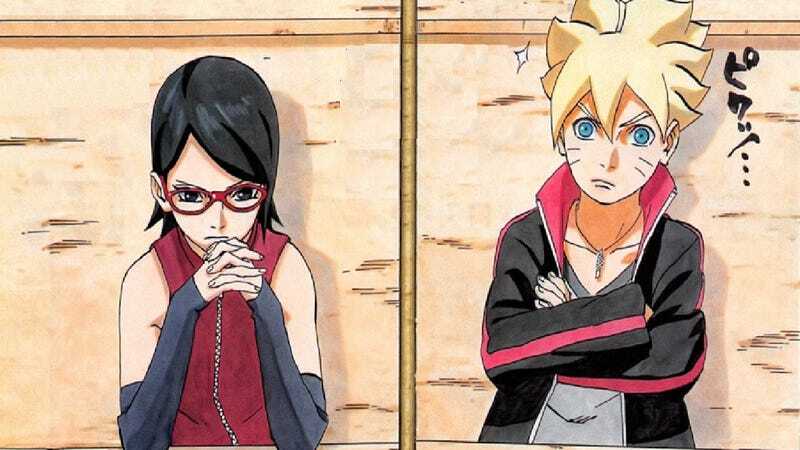 After a tense conversation between Sarada and Boruto (who I now just realized wears a bolt shaped like Tsunade’s necklace that Naruto had) and a humorous conversation between Chōchō and Mitzuki which Chōchō SERIOUSLY misunderstands the quest to return Naruto’s lunch is underway with Sarada now as delivery girl. In this encounter it appeared Boruto actually slightly understood Sarada’s feelings and seemed to show a greater level of understand then I expected of him at first. All the while the interactions of the Ninja are being watched by the mysterious Sharingan user from the previous chapter, using a weird Sharingan wielding animal as a spy much in the same way Pain used his Rinnegan enhanced Summons in the past. Another mystery for another time it appears. However in the end the Return Naruto’s Lunch arc really doesn’t last long as Naruto has been painfully aware of Sarada from the start and notices when the two young kunochi are attacked by Shin Uchiha the mysterious fighter who attacked Sasuke. After a brief battle between Shin and the two, Naruto in big damn hero fashion drops in to save the day, setting up one assumes another one sided fight as Shin has never really shown Kage level abilities. As I said above this chapter felt slower then previous chapters mostly due to it being build up. However the revelation regarding the mysterious man’s Sharingan seems to imply this is not the same Sharingan we knew from the past and more some kind of hybrid between the Sharingan and Rinnegan. Meaning if they are clones perhaps it has something to do with Sasuke’s DNA as the only living user of the two dojutsu. Speaking of dojutsu a comment mentioned last week of do Naruto’s kids have the Byakugan due to being Hyūga’s, I think they will have it but I’m not sure. What do you think? Anyways thanks for reading and see you next week.